Let's get ready to color! It's very easy to use! You can share your pictures on facebook, Twitter and E-Mail. - Choose a sketch from the sketch collection. 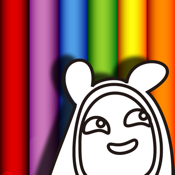 - You can also draw your own pictures and color them later. - After you finish drawing a sketch, please save it with the other illustrations. - For coloring, look it up under: Main Menu → Color → Original.